Gerry spent a lovely hour at lunchtime with Nicky and her team at Animal Health Centre on the Gloucester Road, where I was given tea and cake, but more importantly just over £1,000 from money raised from a fundraising event on Saturday evening. Team Dawglers, as they called themselves, triumphed at the Back to Black night run and came in as first Female Team in the 5K. It was a particularly wet and windy night and conditions underfoot were extremely muddy but they were not daunted. Harry and Brianna (Debbie's children) ran the junior 1k through the dark in the woods and were amazing, running all the way. Six from Animal Health Centre, Debbie, Su, Sam, Lela, Sophie and Nicky ran the 5K cheered on by eleven DAWG dogs and family members. They all finished with a smile and Nicky finished as first female and oldest female, well done all! Thank you so much to everyone who very kindly sponsored these lovely ladies, we are so grateful as are the dogs in our care. Team Dawglers are wonderful thank you soooooooooo much. It's always nice to end the week with some good news. Many of you will remember Milly who arrived at Bristol DAWG last month very thin and in poor condition. 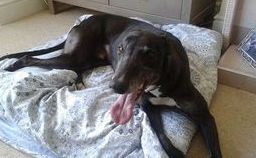 Being a more mature girl we wanted to move her into foster asap and super foster mum Denise Smartt came to the rescue!! In just over a month Milly now weighs 25kg, she had a little wart removed from above her eye and has had several teeth removed - very sad because she didn't have many to start with!! Have a happy life Milly. Brilliant news another DAWG dog rehomed! Sweet little Daisy has gone to live with Nick, Jill and their little Jack Russell, Saffie, in Kings Weston, right opposite Blaise Castle, she is going to love her walks!!! Thank you so much for giving Daisy a lovely home, she was quite a shy girl, but we can see how much she already loves Jill and has already grown in confidence. 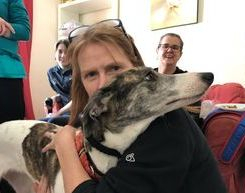 Massive thanks also to Sharon, one of our trustees, who made a greyt foster mum whilst Daisy was waiting for her forever home. We always like to end the week with some good news, two dogs adopted this week, first Connie and then the lovely Lizzie. 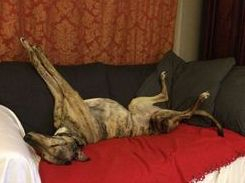 Lizzie (now renamed Willow) has gone to live with the Harris family in North Common, Bristol. Willow has taken to home life like a duck to water and is loving it. For all those people who worry about housetraining a dog which has never been in a home environment, Willow hasn't had one accident, her mum just followed the advice we gave. Thank you so much for giving Willow a lovely new forever home and we hope you will bring her along to events so we can see her again. Well done Eila Maloney for saving this sweet girl. 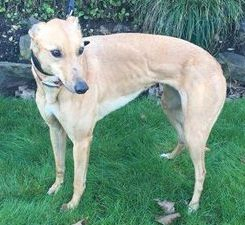 Recently we appealed for a foster home for the lovely Dennis - well, it wasn't necessary because he's been rehomed in Ross-on-Wye with Graham and his family. Good luck to all of you for a long and happy life together. 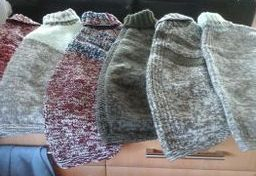 Thank you to Wendy and Tricia for their recent kind donations. Meet the very handsome Prince who will be making his way over the Irish Sea from our very good friend Eila Moloney. Prince will be arriving in the early hours on Thursday morning - thank you Kristie for getting up, what would we do without you. Prince is only a baby just fifteen months. Good news to end a very busy week. The lovely Ruby has found her forever home in Downend with Paul, Julie and their two teenage children. I have just spoken to Paul and the whole family are totally in love with Ruby. She has been such a good girl, sleeping right through the first night, a tiny little cry last night, but nothing to worry about, no accidents, what a good girl. She has met lots of dogs in the park already and seems to like all dogs. 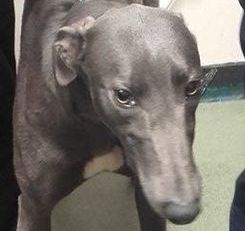 Thank you for giving Ruby a lovely new home and thanks to Eila Moloney for rescuing this greyt girl. Meet the lovely Randy, only one year old and Bristol DAWG's latest arrival. 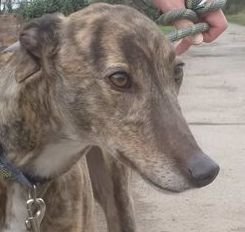 Keep an eye on the Dogs for Adoption page for his details when he has been assessed. 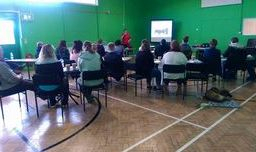 Thank you Hannah Burton from Dog First Aid Ltd for a really well presented and informative course this morning. 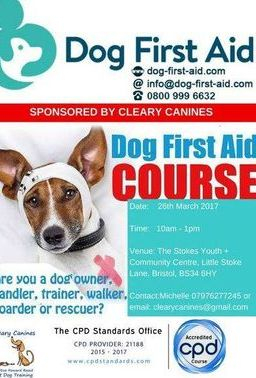 Twenty-one people are now better able to help their canine companions in an emergency. 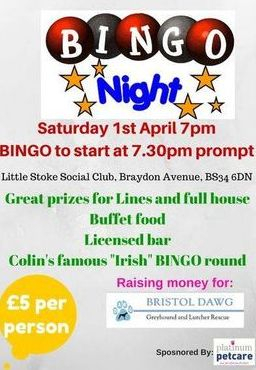 An additional bonus is that it also raised £260 for Bristol DAWG Greyhound and Lurcher Rescue. 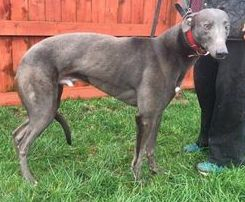 Lovely news to end the week, our special boy Champ has found his forever home in Winterbourne with Les and Paul. Think it is fair to say that Champ has had a hard life, now six years old and was still racing on the Galway track in Ireland in November last year. When he arrived he had a large scar on his back, his thighs were completely bald and generally in poor condition and not looked after. 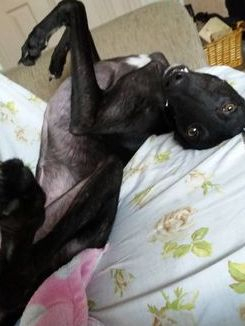 We did a special appeal for a foster and Vikki, Neil and their lovely greyhound girl Siouxsie (also a Bristol DAWG dog) have very kindly looked after him for the last three weeks and helped him learn all about home life and what he has been missing out on for the last six years. Thank you so much. 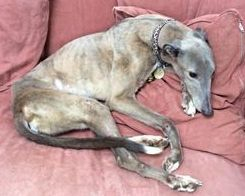 This will be Les and Paul's fourth greyhound, they very sadly lost their much loved Jet (also a Bristol DAWG dog) last week to bone cancer at only nine years old. So sad, but they felt they wanted to help another less fortunate dog. Although Champ has been in kennels six years he hasn't had one accident in the home, has already mastered the stairs and already loves Les so much as he is with him all day. All our dogs are special to us, but this boy is amazing and I personally find it so sad that he has had to wait six years to know about home life. Thank you to everyone who has helped Champ - especially the lovely Eila Moloney who rescued him, you are an amazing lady. We would like to say a massive "thank you" to Susan Grant, Community Life Champion at Asda Longwell Green, together with store colleagues for very kindly nominating us as one of their chosen charities for the next few months for the Green Token Scheme. If you are in the store please pop the token in our box - there is up to £1,000 on offer to winners!! !